Money in the Garage: Merry Christmas! Merry Christmas and Happy Holidays! As the old Andy William's song says, "It's the most wonderful time of the year!" Unfortunately with the economy being so bad it's been a difficult year for some folks. Hopefully, you've picked up a few ideas from my blog this year and made a little extra money during these rough times. If so, that's great! Take some of the money you earned and buy the kid's an extra Christmas present or treat yourself to a nice gift...you deserve it! Here is a nice little flip that's in keeping with the holiday season. I found this vintage postcard of Santa and Uncle Sam in a shoebox chock full of old postcards. Many of the postcards dated back to the 1940's. I paid only a couple bucks for the whole box which had over 200 postcards inside. So when you average it out, each postcard cost me a few pennies. Not only were they cheap, but they were a lot of fun to look through, inventory and auction off. I sold this Holiday themed postcard all by itself. 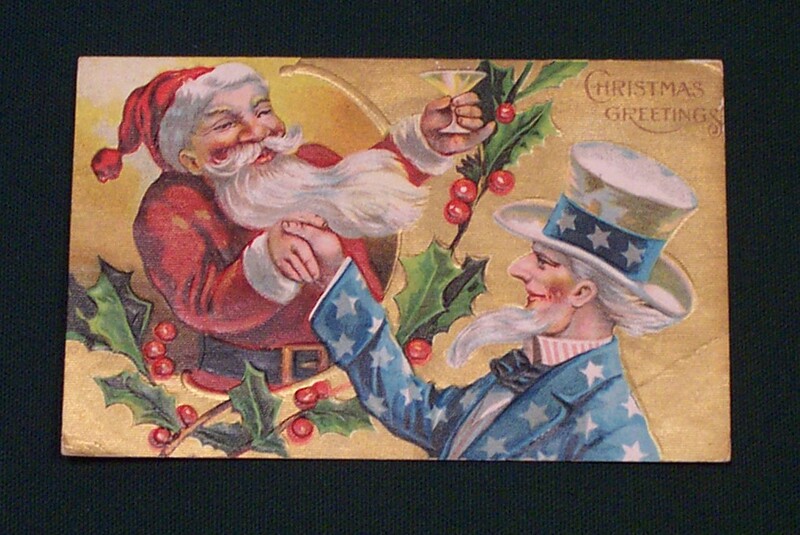 I knew it would appeal to both Santa and Uncle Sam Collectors. I also listed the postcard on eBay during the Christmas season, increasing the number of bidders in the holiday buying mood. Of course my two favorite people in the world; Santa and Uncle Sam did not let me down that Christmas.... they sold for $22 dollars! If you come across big lots of vintage postcards at your local garage sales you should buy them. You can sell them grouped by subject matter such as vacation destinations or if they are really unique, like Santa and Uncle Sam, you can sell them separately. As long as you pick them up at a reasonable price you should do well with them. So Happy Holidays to you and your family! Here's hoping you find lots of money in the garage in 2011! I am really glad you like it. Both inspiring & fun is what I have been trying to go for! Can't help you with the vintage jewelry market though, that's above my grade and pay scale...Ha! Have a great holiday and come visit the blog in 2011! Merry Christmas Dude. I really enjoy your blog, and I'm looking forward to more in the new year. Thanks Utahbill- Merry Christmas to you, hope you snag some sweet deals in the New Year! Garage Sale Season 2010: Officially Closed!